We had some beautiful Springtime weather here in Texas, before it turned chilly over the weekend. The lady bunny was one that my late beloved Mom gave me, and the teapot was a gift from my sister. Really and truly, I tried to resist this adorable bunny teacup from hopping into my hands at HomeGoods, but I got weak, and couldn't refuse! I know, I know, I need another teacup like I need a hole in the head!! I followed Mary's instructions at Home Is Where The Boat Is and did the vase within a vase method of arranging flowers, putting the peeps on the inside of the outer vase. Mary is a friend that always so willingly shares her tutorials with us, and has such amazing, inspiring ideas. Cissy was able to come over and bake this past week, and she brought her cookie press that I gave her, and we made Springtime Butterscotch Spritz cookies, from my friend Lynn's recipe, which can be found here. Lynn always has something great cooking up in her kitchen and I always refer to her as The Queen of Spritz, and the Queen of Deviled Eggs. Cissy and I tried a method of using a small funnel to sprinkle the colored sugar into the center of the glazed cookies. I am leaving on a vacation with two of my high school girlfriends in a week, and won't be able to post or visit for awhile, I'll be thinking of you! These cookies have a delightful flavor! Make a powdered sugar glaze by mixing powdered sugar and water until it's runny enough to spread onto cooled cookies. While the icing is still wet, sprinkle the colored sugar into the cookies before the glaze dries and hardens. 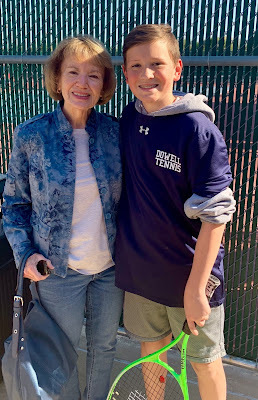 I was able to go to my grandson, Caiden's tennis match, this past week. I am in LOVE with your gorgeous bunny teacup and saucer. The design of the saucer is fabulous. Now Kitty....one can never have too many teacups. =) I understand totally how this pretty found its way into your bag. The little bunny, adorable vase brimming with pretty flowers and the sweet teapot....all make for a delightful tablescape. 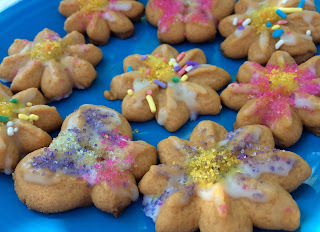 Those Springtime Butterscotch Spritz cookies look perfect for a Springtime celebration. I am delighted that Spring is beaming its beauty at your lovely place. How wonderful for Caiden to have you cheering him on. I love your cookies and it looks like you had a great time making them. The peeps in the vase is adorable! What a cute idea! Your new teacup was worth the splurge. I don't think I have every had butterscotch cookies before. They must be delicious. Adorable photo with your grandson. I can see the resemblance! Oh gosh! Caiden has sailed right by you. That’s always such a thrill for them! Okay, so I’ll not fret if you don’t show up for a bit. Have great fun on your trip. That tea cup is so darling...it’s the rabbit’s cute expression that grabbed you. First I love the sweet tea cup! It is so springy....as are the pretty little spritz cookies decorated for spring. That is an interesting recipe with the addition of butterscotch pudding. They would look so pretty on my Easter table! Love the sweet vase too! I have seen similar vases on Pinterest and thought they were so cute! Enjoy your time away! Sounds like fun! Awe....as always I love to see that sweet Cissy baking! What an adorable picture of you and your precious grandson. Quite a cutie he is too. Loving the PEEP vase. So cute. The tea cup is very pretty. How many do you have dear friend? Hugs and blessings to you Kitty. Hi Kitty, it's so nice the table you decorated. I love the way the flowers and the peeps look together! 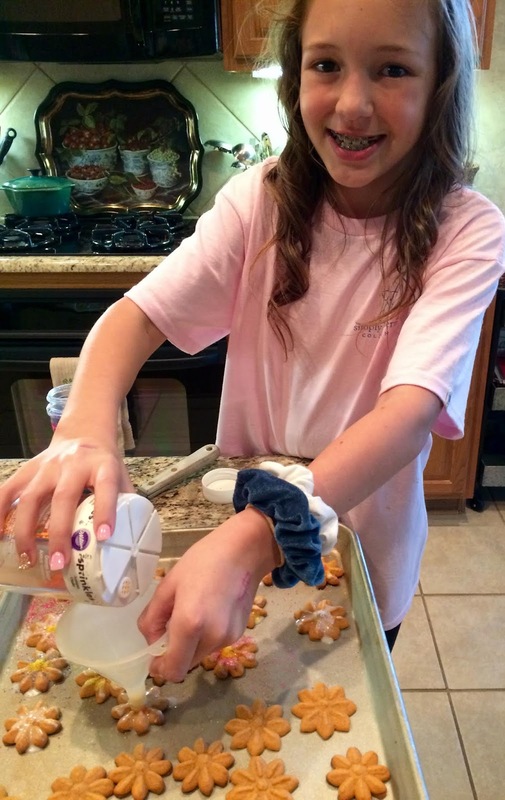 How fun to make the cookies with Cissy. 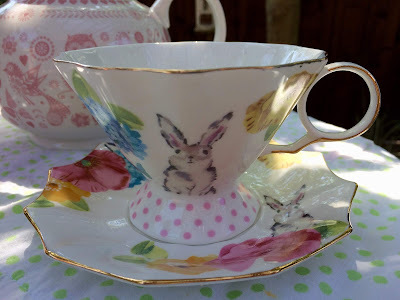 I ADORE that cute bunny teacup and saucer; I especially love the polka dots on the base of the cup. Too cute!! Your flower arrangements with Peeps turned out lovely, Kitty; you're right, Mary does have great ideas for setting a pretty table. 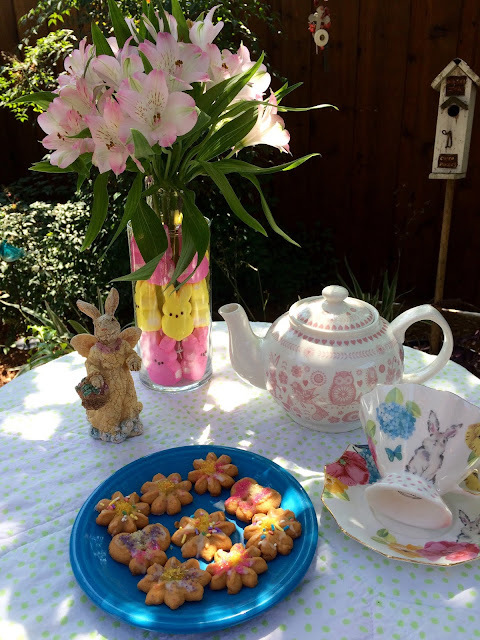 You've done such a pretty table yourself, with the flowers, bunny figurine, teapot, and teacup and saucer. It's a charming celebration of spring! The butterscotch cookies look wonderful -- thank you for sharing the recipe here. You and Cissy sure are good bakers. :D I hope you have a wonderful trip with your girlfriends, and stay safe! I wouldn't have been able to resist the super cute bunny tea set either! Kitty, I would not have been able to resist the sweet tea cup either. Love the springtime spritz cookies and your funnel idea for the sprinkles. I make them at Christmas. That recipe sounds great. Have a wonderful time on your vacation with friends. A mesa ficou muito arrumada, as louças são lindas! Sweet and cute post!I just love your adorable teacup!Beautiful flowers too!Hugs,dear Kitty! Oh Kitty, that teacup is irresistible! Yes, Lynn is the Queen of both Spritz and Deviled Eggs! I wanted to make a butterscotch brownie recipe the other day and the store was sold out of butterscotch chips! So of course I've been madly craving butterscotch ever since! Have fun on your trip! Oh Cissy is gr9wing up so fast! I SAW those adorable teacups at Home Goods and ran away cringing - not easy passing them up, they are soooooooooooo cute! Those sprintz cookies are the perfect tea time cookie - one of these days I'd love to get the press and learn how to make them. Thanks for sharing Lynn's recipe, Kitty! I can see why that bunny teacup hopped into your basket and came home with you! It's adorable. The cookies look delicious, too. I hope you're having a wonderful time with your friends. Aw, I hope you have an amazing time away with your friends, Kitty! You so deserve this. God go with you and keep all of you safe and healthy. Can't wait to hear all about it when you return, my friend. Praying for you! What a darling bunny teacup and what a cute idea with the "peeps' inside the vase...I love that idea! The cookies sound so yummy and are just perfect for Easter. I know that grand boy appreciated you being at his game too! I love spritz cookies but have never made butterscotch! These look so good! 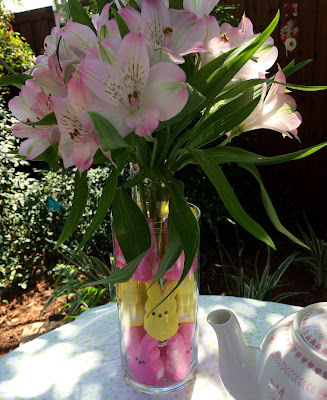 Love the peeps in the vase - that caught my eye right away. And that bunny cup and saucer - LOVE and of course you couldn't pass THAT one up. So unique and pretty! We are supposed to see our first 70 degree day on Sunday! Kitty you have lovely grandchildren, I love to see you and Cissy bake together, it reminds me of when our granddaughters and I baked when they visited. the recipe sounds delicious, must try it. Enjoy this special trip with your girlfriends. Yummy Yummy ... You always have such sweet recipes for holiday celebrations ... I love butterscotch and I also love sprinkles . ( I'm just one of the kids) ... Your little bunny vase idea is so cute with the edible insides (ha ha) That's a PLUS !!! ...Don't you love it when a teacup hops up to you and says ... BUY ME ... How could you resist ...It's darling and so perfect for your table decor and cookies . Takaing time for the boys is always a fun detour in our daily activities ... and the pictures are worth their weight in gold ... Lovely memorabilia. Such a sweet teacup and saucer with the bunny, love it. I will most definitely make the recipe posted for the butterscotch spritz cookies. I love butterscotch. I made butterscotch scones yesterday. It was nice reading your cheery blog this morning and seeing smiles from all. Hope you are having a wonderful vacation. Adorable, Kitty. The cookies look delicious.